Cyril Luximan is a painter and interior decorator. 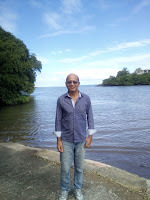 He lives at Souillac, located in the southern part of Mauritius. He loves writing songs, poems, short stories and jokes. He has contributed to many music albums and participated in many poetry reading programmes on local radio and television. He is also the master of ceremony of many cultural events. Cyril Luximan is the author of the Mauritian Kreol poetry book, Otour Lamour (Centered around Love) and Pikpik, a story book for children. His poem Eleksion was selected as the winning poem for St Valentine Contest 2013 held by Scope Magazine, Mauritius.